If you're absolutely sure you need mesh networking and you're already tied into the Netgear ecosystem, the Nighthawk X6 delivers excellent performance. Otherwise, a less expensive extender may do the job just as well. Netgear's enthusiast-grade Nighthawk line has been the flagship of the company's consumer-targeted networking products for quite some time. You've probably noticed them walking through the electronics department of your local big box store. They tend to have the flashiest packaging, the best collection of features, and the highest price tags. The Netgear Nighthawk X6 EX7700 AC2200 Tri-Band Wi-Fi Mesh Extender is no exception to this rule. Like other products in Netgear's Nighthawk line, the X6 EX7700 boasts mesh networking, and MU-MIMO technology, which sets it a notch above other extenders, but it also commands a premium price. We spent a good amount of time putting the router to the test, evaluating design quality, network performance, connectivity, and the usefulness of its features. One of our favorite aspects of the Nighthawk X6 is the design. Let's face it, most Wi-Fi extenders are just not attractive. They tend to be big, plastic, utilitarian lumps with multiple antennae poking out here and there. 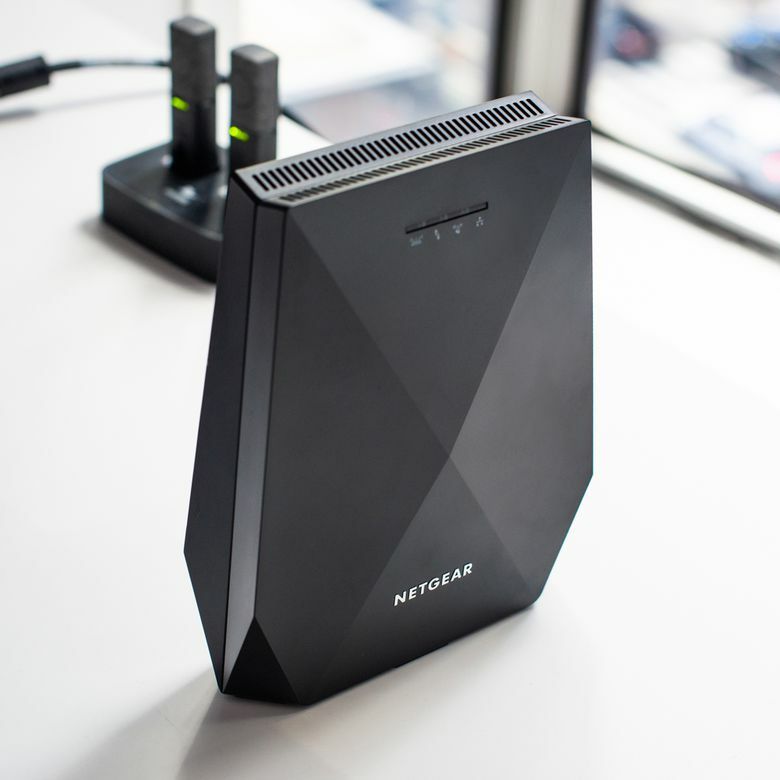 However, like most other Netgear Nighthawk products, the X6 has a flat black, angular look, like a stealth bomber. The X6 also forgoes a sin many extenders suffer: plugging directly into a wall outlet. The extender is thankfully designed like many of Netgear's smaller routers. It has a small AC adapter that only takes up one plug, with no awkward overlap, and can sit on a table, desk, or another flat surface. The extender, minus any cords, is relatively small at 7.8 x 6 x 2 inches. Since it's thin, you can either display it out in the open without taking up much table space or slip it behind or between something if you want it out of the way. The non-plug-in design also has one incidental advantage aside from just looking better. Since you're not limited by having to place the X6 directly into a wall socket, you can place it higher or lower in a room to more easily find that sweet spot where you're at the optimum range from your router. The X6 also forgoes a sin many extenders suffer: plugging directly into a wall outlet. Finally, the inclusion of an easy-to-use on/off button is a great feature. While you likely won't be turning it off much, it's nice to have the option with a simple push button. The Netgear Nighthawk X6 has a setup that mirrors pretty much every other Wi-Fi extender on the market. However, it does have some useful features that make this setup a bit smoother. The first thing you need to do is plop it down next to your router and plug it in. When it turns on, you just hit the WPS button on your router and the X6 and boom, you're good to go as far as basic setup. When the X6 connects to your router, the Router Link LED will turn white, signifying a strong signal between the two. If you used WPS, then the X6 should have cloned the network settings from your router, keeping the same SSID and password, so you won't have to fiddle with connecting to separate network. Now, you get to proceed with the most fun part of installing a Wi-Fi extender: finding that sweet spot. Since you bought an extender, we assume you've noticed a dead spot in your house. The easiest way to get coverage is by moving the extender to the halfway point between your router and the dead spot. If the Router Link LED doesn't turn white, you'll have to move the extender closer to your router to get the best possible speed, though if it's amber you'll still have a "good" connection. Alternatively, if you still don't have coverage in the dead spot, you'll have to move it further away. It can be a frustrating little shuffle depending on your situation, but the Router Link LED helps a lot with pinpointing the outskirts of your router's Wi-Fi coverage without having to access the web interface. If you don't want to use WPS, or if you have a hidden SSID you'll need to access the web interface to set it up. You can do this either by connecting to the extender using one of the two Ethernet ports on the rear of the unit or by connecting to the temporary Wi-Fi network it generates. The Netgear Nighthawk X6 EX7700 Mesh Wi-Fi Extender looks great, performs reliably, and is feature-packed. If you decide to set the X6 up via the web interface it's only a bit more complex than using WPS. There's a wizard that will take you through all the essential steps and allow you to either clone your router's settings, or set up the extender under new SSIDs. There's no software you have to install locally to use the Nighthawk X6. In fact, if you use WPS to connect to your router, it's possible you may never have to see the extender's interface. If you need to change settings, though, you will end up having to use the web browser. The same goes for if the extender loses connection with the router. You’ll need to connect over wired or wireless connection to log in and troubleshoot. Don’t let the web interface scare you, though. There are plenty of options available for advanced users that let you do things like limit usage to set times, set a static IP for the extender, use MAC filtering, and all the standard options you usually get with a Netgear product. That said, you won't see the same variety as you would with custom firmware like OpenWRT. The Nighthawk X6 is a tri-band range extender featuring one 400Mbps 2.4GHz band and two 866Mbps 5GHZ bands. This offers a theoretical speed of 2.2Gbps according to the extender's documentation, but in reality one of the 5GHz bands is used for the Fastlane3 feature. Fastlane3 creates a direct link with the router which is supposed to lower congestion and the packet drop that is associated with high-traffic extenders. The X6’s quad-core CPU which should help speed up the processing of requests a bit as well. One of the big selling points of the X6, and one of the reasons it commands a hefty price is its ability to form mesh networks. In our testing, from around 10 to 25 feet away from the extender, we were getting around 150Mbps down. Given we have a 300Mbps connection, this isn't bad and is around what we normally get from our router's Wi-Fi. From 25 to 40 feet away, we got a bit of a drop, with speed decreasing. After 50 feet, we started to get intermittent signal drops. Finally, at around 75 feet, the network started dropping out completely. Of course, your results may vary depending on your living area. The biggest impediments to Wi-Fi signal are walls and floors. The thicker they are, the more range they'll knock off your signal. Overall, we were fairly happy with the amount of range the Nighthawk X6 added to our router. The X6 additionally supports MU-MIMO (multi-user, multiple input, multiple output), which can make it a good choice if a lot of devices are going to be used simultaneously on the extender. It essentially processes requests more efficiently, and also works to lower network congestion. However, not every device is MU-MIMO compatible, specifically older devices, so you’ll want to keep this in mind if most of your hardware is more than a couple years old. One of the big selling points of the X6, and one of the reasons it commands a hefty price, is its ability to form mesh networks. Basically, a mesh network is a group of devices that automatically work together to most efficiently get your data to you. So, if you have several X6 extenders configured, they'll work together to find the best route to send your requests to your router and then transmit the data back to you. That means if you have a big area to cover, you can chain together whole strings of extenders, or have them placed in strategically overlapping areas, and they'll automatically adjust to demands as you move throughout your house. All the configuration is automatic, and it takes very little technical know-how to set a mesh network up. This all sounds great, but keep in mind that unless your living area is huge, you likely won’t need to set up a full mesh network. Netgear claims just one X6 can increase your Wi-Fi coverage to 2200 square feet. These are under ideal conditions of course, but the fact is, unless you live somewhere palatial, or with multiple floors, you're not going to get a ton of benefit from a mesh network. It's also worth noting that there's no standard when it comes to mesh networking at this time, so if you choose to deploy one with Netgear, you're going to be stuck with Netgear's proprietary form of the technology. In addition to that, you’ll need to buy more extenders which can quickly become expensive. Most users with a truly large living space will find it simple and easier to use a mesh Wi-Fi setup like Google Wifi or the Netgear Orbi. They can be costly, but they’re much easier to set up and manage. Price is really where the Netgear Nighthawk X6 gets dicey. With an MSRP of $159.99, you really have to take a long look at whether you really need any of the extra features it offers. If you're extending Wi-Fi in your home and only a few people will be using it, MU-MIMO isn't really that big of a deal. Additionally, one of the highly touted features of the X6 is that it can use the same SSIDs as your route. However, you can just do that with any extender, it just might not be automated depending on the model. Besides the mesh networking, which is only going to be useful if you need to extend Wi-Fi coverage to a very large area or have a multi-story dwelling, the X6 doesn't do much to differentiate itself from other AC2200 extenders. The Nighthawk may be viewed as “overkill” when laid out against the rest of the pack of Wi-Fi extenders in the world, as it features a veritable laundry list of abilities that other devices simply don’t have, but the price also makes it stand out. It costs twice or thrice cheaper extenders like the TP-Link AC1200. Its true range is better, not to mention features like MU-MIMO, but we can’t help but think if you truly want to take advantage of mesh networking, you’d get something like the Netgear Orbi instead. The Netgear Nighthawk X6 EX7700 Mesh Wi-Fi Extender looks great, performs reliably, and is feature-packed. Unfortunately, the price is a bit too high compared to other extenders on the market, and the features that set it apart from the competition just aren't a necessity for most users. Product Dimensions 7.85 x 6.07 x 2.14 in.